AMHERST, N.Y. – Daemen College President Gary Olson emphasized the college is strong, successful, and growing as a leader among higher education institutions across the country in his fall State of the College Address given on Oct. 2. To underline this, Olson announced that Daemen’s robust recruitment efforts have resulted in successfully meeting this year’s goals for new graduate and transfer students and the college is only a few below its target for first-year students. Olson cited many physical signs of progress on campus, including ongoing grant-funded renovations of the college’s historic Curtis Hall, major refurbishments in the science facilities, and roof replacement on four buildings. Beyond the college’s Main Street campus, he noted the recently announced New York State Department of Education approval for branch campus status for the college’s Brooklyn program, a unique educational offering customized to fit the needs of the Orthodox Jewish community. 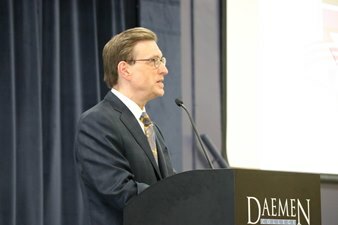 In his address, Olson reported that Daemen has reached nearly 85 percent of the $22 million goal for “Drive to 75,” the college’s first-ever comprehensive campaign. The “Drive to 75” campaign, which was publicly launched last fall, will raise funds for campus and academic enhancements, and student scholarships and professorships. Moving forward, Olson noted that Daemen is well-positioned for the future through a number of recent college-wide initiatives, including recruitment and retention efforts, enhancement of inclusion and diversity measures, improved cybersecurity, and the addition of an esports team.